← What Does a Background Check Look For? Criminal record expungement is an understandably complex topic. Many people are just as confused as you are; so use these frequently asked questions and answers to help! Do you have a past criminal record in Indiana from years ago? Have you had questions about the new criminal record expungement laws and regulations? Fortunately, there are trustworthy sources of accurate information regarding your expungement concerns. The best route to take is speaking with a licensed criminal lawyer that specializes in criminal expungement services. It is important to choose an attorney that is well-versed in the new Indianapolis criminal expungement laws, since some are not. Continue reading to get some quick answers to some frequently asked questions about expunging criminal and arrest records in Indiana. If I Don’t Know What’s On My Criminal Report, How Can I Find Out? The best way to get a copy of your criminal history is to contact the local sheriff or clerk’s office in the county of your offense. They should be able to provide a records you need. If you have offenses in more than one county, it would be most efficient to have your expungement lawyer recover these documents for you. They have resources that make locating multiple crime records, easier. What Do I Do If I Have Multiple Cases? You will need to file a petition for expungement for each case in their separate counties. An experienced expungement lawyer will know how to efficiently and effectively do this for you. You can expunge multiple convictions at once, if you meet the eligibility requirements. There are several limitations and prerequisites you must meet in order to be an eligible candidate for expungement. For example, to be eligible to expunge arrest records, the arrest couldn’t have led to charges being filed against you, or the charges were later dropped as a result of mistaken identity. Basically, the court must find that there was either no crime committed, or not enough probable cause for the arrest. This is just one facet of the many stipulations involved with the expungement process. Contact a trusted criminal defense attorney that specializes in expungement services, and they will navigate the entire process for you, in a safe and secure manner. You start by filing a petition, and several other forms and documents, and may even have to attend certain hearings. Yes. The most common reasons to be denied include inaccuracies in court files, inaccuracies in applications, having additional pending charges, and not meeting the required waiting period. Talk to your lawyer about preventing these mistakes from happening. You only get one chance to file for expungement, so just one simple mistake can take that opportunity away forever. Are the Benefits of an Expunged Record Worth the Effort? If your arrest records are expunged, your fingerprints, mugshot, and all other documentation regarding the arrest and subsequent charges will be withheld from public access, including employers, loan officers, landlords, and more. Only law enforcement and government agencies will still retain these records. You can feel confident renting a home, applying for a loan, or going for that promotion, without fear of your criminal record holding you back. Call Attorney David E. Lewis at 317-636-7514 to learn your eligibility for criminal record expungement in Indiana. We are eager to help you get the fresh start in life that you deserve! Our services start as low as $850, so you can afford to clean up your record just as much as the next guy. Call 317-636-7514 to schedule a consultation, today. 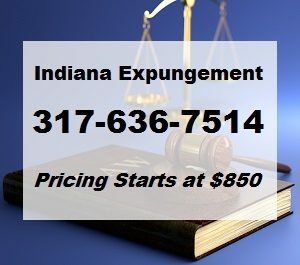 This entry was posted in Indiana Criminal Record Expungement and tagged criminal record expungement attorney, criminal record expungement Indiana, criminal record expungement info, criminal record expungement law. Bookmark the permalink.